FRESNO, California -- Kori Muhammad, 39, is in Fresno Police custody after a shooting rampage in Downtown Fresno. Police said Muhammad starting shooting just hours after authorities announced he was wanted for the murder of a security guard shot and killed last Thursday night. 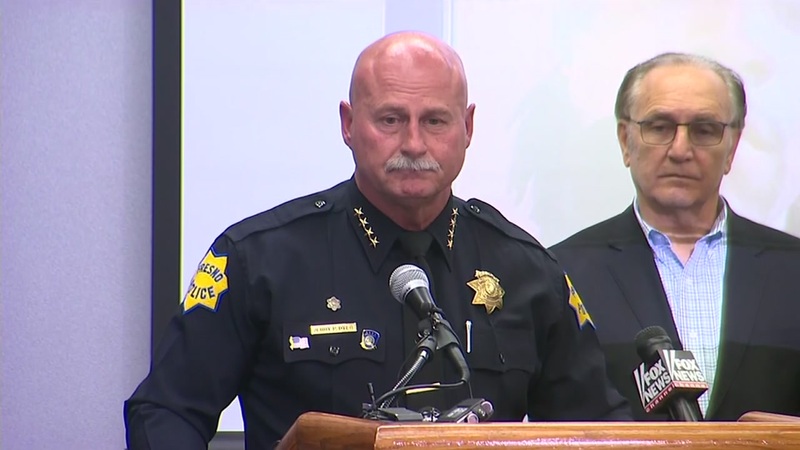 In a press conference on Tuesday, Fresno Police Chief Jerry Dyer said the police Shot Spotter system registered 16 shots in four different locations. All rounds were fired in less than 1 minute. Police gave chilling insight into the killings of three people in Fresno Tuesday. Investigators said Muhammad opened fire at a PG&E work truck around 10:30 a.m. Tuesday morning near Fulton and Van Ness-- killing an employee in the passenger seat. Action News was there the moment a PG&E truck pulled up to Fresno Police Headquarters after a shooting in Downtown Fresno. The victim's co-worker drove him to police headquarters but the man was pronounced dead. Police said Muhammad kept walking, shot at another man but missed, then found another victim on Fulton Street and killed him. They said he then reloaded and killed a man in the Catholic Charities parking lot. Action News Reporter Joe Ybarra witnessed the dramatic end to the violence in Downtown Fresno. Chief Dyer said he does not believe Tuesday's attack was related to terrorism but appears to be a hate crime since all the victims were white men. The Islamic Cultural Center of Fresno has put out a statement condemning the acts of violence committed by Muhammad. Local Muslim leaders said that they do not know him. Dyer has called in the FBI to help with the investigation, and at this time, the firearm is still missing. The identities of the victims have not officially been released by investigators but we are learning more about each of them. The first person who police said was gunned down on Tuesday was a PG&E utility worker sitting in the passenger seat of the truck. We know the 34-year-old was on his first day out in the field. Family members identified the second victim as 37-year-old Mark Gassett. Gassett had just left the Catholic Charities with a grocery bag full of food when he was shot. They said he was a father and will be missed by many. Family members identified the second victim as 37-year-old Mark Gassett. Another, a 58-years-old man, was also shot and killed in a nearby parking lot. Police said he may have been a client of Catholic Charities. Fresno officials have been calling for prayer for the victim?s family and for the community. Fresno officials have been calling for prayer for the victim's family and for the community. Statements of support have also been coming in from around the state. Attorney General Xavier Becerra issued a statement about the shooting, saying, "My thoughts and prayers go out to the families affected by the shooting in Fresno. Thank you to the first responders who leapt to action and quickly gained control over the situation. I will continue to follow the investigation closely. The California Department of Justice has offered its full support and law enforcement resources to the people of Fresno." I love the city of Fresno and will forever! I'm so sad to hear what happened there. Stay strong Fresno! Praying for you! Derek Carr also tweeted out saying, "I love the city of Fresno and will forever! I'm so sad to hear what happened there. Stay strong Fresno! Praying for you!"